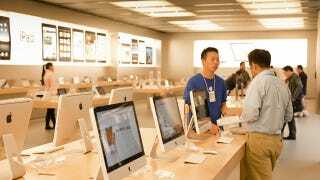 Apple have been trialling a new system which alerts store employees when you arrive, if you pre-ordred goods using your phone. But is that the end of queuing, or a a step too far? If you own an iPhone, you can download the Apple Store app and shop before you head into the store. When you arrive, the app's location feature lets store workers know you're there via their own iPod Touch. This is similar, though not as extreme, as the rumour of Apple Store self-checkout systems we reported last month. So far it's been slow to take off, but according to The New York Times, sixteen customers used the system to pick up their purchases at the Palo Alto store on Friday. Of course, Apple Store employees have been able to locate customers in all of their stores for a while, but not in this way. Instead, Apple stores have had iPads dotted around them, from which customers can alert a member of staff if they'd appreciated some attention. "It's more toward customer experience. We don't want to feel like we're hassling our customers to shop. We want them to feel at home." Last week we reported how on Black Friday two shopping malls — the Promenade Temecula in California and the Short Pump Town Center in Richmond, Virginia — were planning to track the movements of their shoppers using the unique ID numbers of their cellphones. Understandably, the idea met with its fair share of criticism.